I Love You Phillip Morris was destined to be the cult movie of the year. Written and directed by cult veterans Glenn Ficarra and John Requa (Bad Santa), and starring the always zany Jim Carrey, there seemed to be little to prevent this film from skyrocketing into a sleeper hit. Add to all of this that the MPAA didn’t know what to do about the homosexuality in the film and that it endured an 8-month delay and burgeoning controversy, it seemed a shoo-in for a number of award ceremonies. So what stopped it from achieving a meteoric rise? It was just alright. Not good, not bad, just…ok. And this, it seems is the nail in the coffin for any forgettable film. Phillip Morris tells the story of Steven Russell, a happily married business man who realizes he is gay. In order to afford the luxuries of being gay-the implicit flamboyance, expensive tastes, and small dogs – he must become a con man, and he becomes a genius when it comes to stealing people’s money. When he goes to prison, he meets the titular character, and as you’ve probably guessed, falls deeply in love with him. According to the real life story, Russell would break out of prison repeatedly in order to rendezvous with his clandestine lover. The numerous stories recounted in the source memoir are rife with material for Jim Carrey to use in this absurd story, but for some reason it doesn’t quite work. The film begins several times over the first 45 minutes, seemingly trying to decide on a plot. There are several storylines that start, and only one is carried through to resolution. But until you get halfway in, it is difficult to anticipate which that will be. Furthermore, Jim Carrey’s performance is reminiscent of SNL-era Jimmy Fallon. He doesn’t trip over his own jokes, but he does break character, lapsing during some of the best moments in the film into his Ace-Ventura-esque goofiness. My issue is not with the goofiness in itself; it could be perfect for this film, and perfect for Carrey. Rather, it is the constant shift in tone that threw me off at every turn. For example, the film opens with Carrey on his deathbed. He then proceeds to tell us how he got there, which gives him the chief narrative voice in the film. Once we leave the gravitas of the hospital room, though, we shift radically between the genre-poles of romantic comedy, slapstick comedy, courtroom drama, and sobering biopic, to name four. The film is unsure of what it wants to be. That said, the film has its redeeming qualities, two in particular. First-Ewan McGregor is absolutely stunning in the title role. It is quite possibly his best performance to date, and is free of the lapses into caricature that Jim Carrey gives us. It is almost as if McGregor didn’t realize he was in a goofy comedy, or rather that he has the dignity to give a role his all regardless of the content. Either way, he is fantastic. The other good, even great, thing about this film is how it subverts the standardized tropes of popular media. Only in the last year or two have we been given gay characters to whom we can relate, cheer for and become emotionally attached to inside mainstream culture. Yes there have been gay characters in indie films, or on HBO. But the only character I can think of who is a protagonist (not a token minority) and intended for the largest possible audience is Chris Colfer’s Kurt from the show Glee. 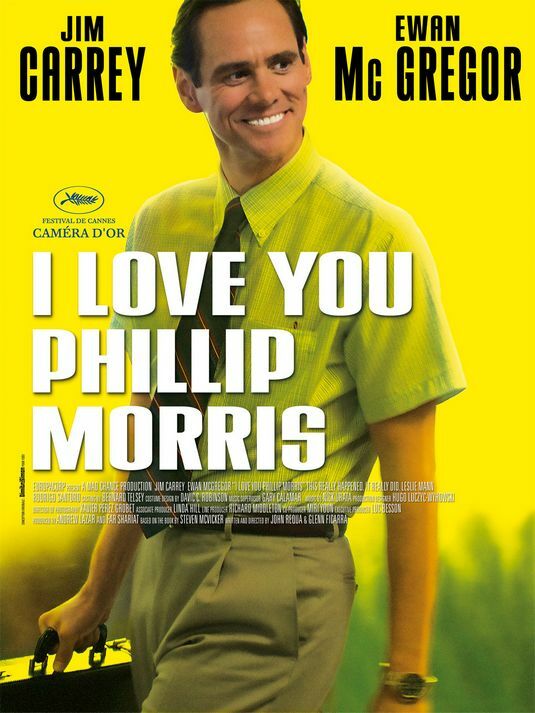 If nothing else, I Love You Phillip Morris has taken a huge step in the right direction for equal representation. If offers America a gay character to rally behind, and for having the balls to be the star, Jim Carrey deserves some recognition. It is not the best role in his career, it isn’t even close, but his portrayal of a sympathetic gay protagonist deserves some respect. Phillip Morris will remain enshrined in the world of cult movies. It was swept under the rug by its distributor who didn’t understand how to market a gay-Jim Carrey movie. It was delayed by the MPAA because they didn’t know how to handle a gay-Jim Carrey movie. Now that it is out on DVD, I anticipate people will throng to their video stores to finally get a chance to watch it. Many of those will be as disappointed as I was, but a few will find something meaningful in it, and to them it will have value. I guess this is just one movie frenzy I won’t be a part of. This entry was posted in Reviews and tagged Ewan McGregor, Gay, I Love You Phillip Morris, Jim Carrey. Bookmark the permalink.